I just finished two projects. I think they turned out pretty good. 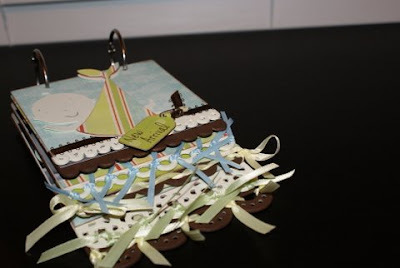 The first is a small baby book made with a Maya Road Scalloped ring album. I think I am going to add a couple more touches to this album. It's going to be a great class. Also the papers are double sided. I used the sides of the paper that were kind of gender neutral but this could be totally frilled up for a girl or toned down for a boy. My next project was a Valentine's Day explosion box. I told Debbie that if I was going to do another explosion box class we were going to make this one special. On this box the base layer has flip out panels and the middle layer is a clear acrylic sheet. Super COOL!!! Now it's time to start thinking of ideas for March! The class for this baby album was great. I am in the process of making two more for a girl and a boy. I was amazed at how easy it was to put this together as the demo book looks so marvelous and intricately detailed. Thanks Sandra for sharing this with a class. It's a great gift idea for baby showers. I am just an everyday person trying to make extraordinary art. My goal is to inspire others to do the same. I am married to my best friend and we have a lot of fun together when he can get me away from my craft area. I am mainly a scrapbooker but I have been know to venture into other papercrafts.